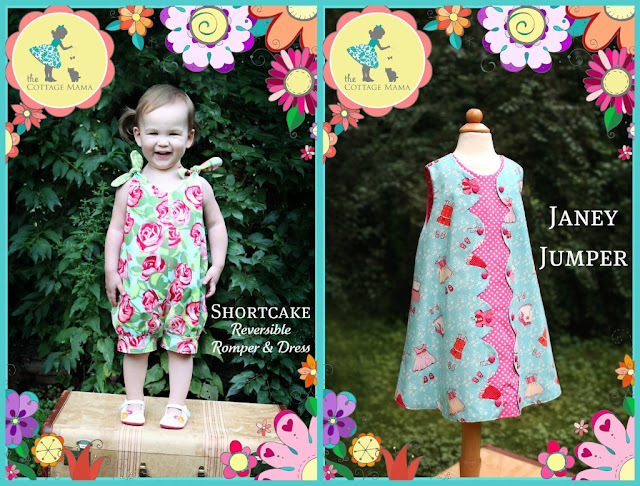 Lindsay of The Cottage Home just released her first two patterns and sent one my way to play with: the Janey Jumper! The first thing I fell in love with were the scallops. If there was such a thing as Scallop Fan Club, I just might be president. Or at least secretary. I even found a button with scallops! I know, it's a sickness. I chose to use a black linen with a scalloped print cotton/linen accent fabric. I'm not sure why Pearl's playing a mime. She's awfully fun/annoying to photograph. The length is perfect for the summer or, paired with leggings/skinny pants/thick tights for the colder months. Lindsay is offering two of her patterns to my lovely (the loveliest, if I do say so myself) readers. THANK YOU-- GIVEAWAY NOW CLOSED!! Or you can get a pattern from her etsy shop. I'm loving the scallops too. My daughters would love this jumper! This is such a cute jumper, I need it for my girls!! I love this pattern, it's so cute. I love seeing it on Pearl. Since my kids aren't babies anymore, it's nice to see things on older girls. I love the colors you chose for the jumper. I want to try the ruffle front one as well. I love the scallops, too! Both patterns are adorable! I like the Cottage Home. I'm a follower of the Cottage Home. such a sweet dress. and i love how you "wintered" it! This is one of my favorite interpretations of the janey jumper, I love the black and red! I love the scallops too! Love how you did the solid with a pop in the middle. Most of the versions I have seen are opposite. I follow the cottage home! I love it! That pattern looks like it has so many possibilities, with different fabrics. LOVE this jumper and want to make that scalloped one! This is an adorable jumper--with so many fun options! I'm loving the scallops too. I'm sure I'd make that version a bunch of times if I won. Oh, what a fresh take on the jumper idea. I can see many fabric possibilities for this. I follow The Cottage Home blog. Lindsay is great. I like The Cottage Home on Facebook. Thank you for the chance to win! I would love to make this precious jumper. I love the sweet details in this jumper and would love to win the pattern. I love the scallops too...so many possibilities with the fabric peeking through! I'm a follower of the Cottage blog! Cute jumper! Love your choice of fabrics too. Thanks for the chance to win! I do follow The Cottage Home blog and like The Cottage Mama on FB. I love your color/fabric combination. It seems like the possibilities are endless with this pattern. I would love to win it. Soooo cute! You did a great job. I would love to win the pattern. I am already a follower and like her on fb. I love the jumper and it's great for 'big kids'. Thanks for the chance. I have three girls and would love the chance to sew up a few of these! Way cute dress! Thanks for the giveaway! Your little model is sure a card! Love when they pose with their own style. I already like Cottage Mama on FB. Such a cute jumper! I love scallops, too! I like the jumper you made. The scallop version is pretty cool. Ooh, I'd love to win a new pattern. So cute! This is way too cute! I think my gal might actually wear something like this. Hope I win! The dress (and model) are just darling! I met Lindsay at Quilt Market and she is such a sweet gal. I know her patterns will do great! I can say, I wouldn't mind getting my hands on this pattern. Thanks for the opportunity! I love the scallops! Cute, cute! Darling! Love the button too! I have never tried scallops before; at least not the sewing kind! They would be a fun challenge! Everyone of those photos of Pearl brought a smile to my face. She does look like fun. I am now following the Cottage Home Blog. I normally don't like black on little girls, but I love how this one turned out. It looks very sofisticated.It's a lovely pattern. I already follow The Cottage Home in my Google Reader. I need more scallops in my life. What an adorable jumper. I love your scalloped button ! And already follow The Cottage Home. I was already *hearting* this over at Lindsay's website. Great twist you put on yours! Such a cute jumper! I have to say that her Pearls expression in the second to last photo looks very Jim Carrey-ish! Very mischievious indeed! LOL! Oh the scallops make me swoon! katy, your interpretation of this pattern is inspired! absolutely amazing. The scallops are darling, but that jumper is super cute too. I love the ease of jumpers in the summer. I like your choice of fabric. I especially like that cute and silly niece of mine. PS I am missing you today. No particular reason. But I sure wish we lived closer. Ha! We're not even on the same continent any more. You did a great job on making this jumper for an older girl. Pearl looks like she's having fun! This is absolutely adorable! I have a mild obsession with scallops too. Scallops Anonymous here we come! I love your version of this dress - it suits an older child much more, and black is so great on kids. I already "like" the Cottage Home on Facebook. How fun it would be to make matching jumpers for my 2 girls. I am a follower of the Cottage Home. pearl looks great in that sweet outfit. i love the fabrics you chose. I love this pattern! And your fabric choices are lovely. Just started reading...thanks for the inspiration. How I wish I had girls... but I'm blessed with two adorable nieces and these jumpers would be great handmade gifts! Thanks for counting me in! I love these scallops! Thanks for the giveaway!! And I like The Cottage Mama on Facebook. I would love make this dress for my daughter! I subscribe to the Cottage Home Blog. what a fun dress! love it!! I am a follower of Lindsay's blog!! Hi following The cottage home. Thanks. I have 3 boys !!! But have 3 nieces and many girl friends that would love this !!!! Count me in...On my way to the cottage blog !!! Thank you !!! Love it! The black scalloped version is very unique. This would be so fun! Maybe I can adjust the pattern to be my size? How cute is this? I would love to sew this cute little dress for my smallest daughter. The button is simply perfect! That's why we love sewing, right? This is such a great pattern. And your version is stunning! And I'm a fan of the cottage mamma on facebook. Woo! Oh I would love to get my hands on this pattern. So precious. I follow Cottage Home on Facebook as well. Great blog. Love love love the scalloped dress. Would love to have it. Very pretty scallops!! I agree, they're simply lovely! I'm now following The Cottage Home Blog, and I've ‘Like’ed The Cottage Mama on Facebook. Love the pattern. My girls would love the possibilities. I would so love to win this pattern. I am aunty janey to two little nieces so it would be such a fabulous gift for them! I love that you have used one solid fabric - it really makes the scallops pop! Well I love the dress... but I have to say that little girl has totally made my day, she's gorgeous and very impish with the poses and expressions. Katy, would you consider a give-a-way of Pearl? JK but she is just cute as a button. 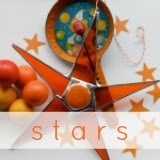 You changed the header on the blog...cute! I've been reading in Reader so I don't see the blog headers. This would make a darling dress for our girlie girl grand-magnificent. Love the scallops. Love the versitilty of the jumper. Great for any season. I'm surprised how different your version looks than the floral print. I love seeing how a different print or fabric choice alters the look of the finished product. Thanks. I follow the Cottage Mama on Facebook. I follow the Cottage Home blog through Google Reader. Thanks! So, so cute. And I love the dress pattern too. Thanks for the chance to win. I too am a scallop lover! This dress is adorable! What a great pattern, and I love the quirky personality showing in this photo shoot. Oh my that is too cute! The pattern is fabulous too! Love the faces of your girl. Pretty color combination! Thanks for giveaway! Love the jumper and the button detail. I follow TCH on fb. Scallops. Good enough to EAT! What a great post - your daughter's poses crack me up! I now follow the Cottage Home blog - very cute! ...and I like the Cottage Mama on Facebook. Thanks for the post - always love to find cool new ideas!